19.9ft Fletcher 199 Arrowshaft Speedboat. PLEASE NOTE WE HAVE REVISED THIS LISTING DUE TO SOME INFORMATION COMING TO LIGHT. WE HAD LISTED THIS AS AN ARROWBOLTWHEN IT IS IN FACT A FLETCHER 199 ARROWSHAFT BRAVO WHICH IS VERY RARE AND QUITE SOUGHT AFTER. We are selling this 19.9 ft Fletcher 199 Arrowshaft Speedboat due to a new boat. This boat is very rare and is 1 of only 120 made.She has served her purpose very well to us over the last 8 eight years, we use her for water skiing on our local river and she is more than capable of pulling 3 skiers behind her.The engine is a Mariner 200bhp V6 2 stroke oil injected outboard engine with power trim, tilt controls and a stainless steel prop, very clean and very powerful.The boat has a large fuel tank at the front and a Quiksilver secondary tank at the rear.The carpet was laid 6 mths ago and the seating was reupholstered 7 mths ago.She is extremely fast and is only ever used on freshwater.She is currently dry stored and is excellent cosmetic condition. The boat itself has no water damaged what so ever (solid flooring and seating. 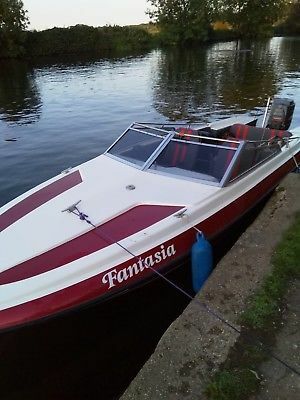 )Comes complete with radio and Fish Finder.The seating is very comfortable with leather upholstery.Trailer is included and is a roller coaster trailer.Could be used on the sea.Being readvertised due to being let down.Please feel free to ask any questions or call Gary on 07766010366.